Center Fielder and Elberfeld, with Whom Re Collided, Both Doing Well. 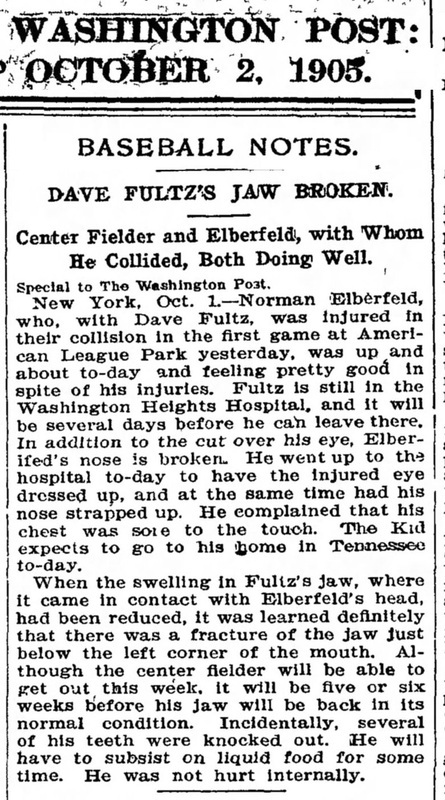 New York, Oct.1 — Norman Elberfeld, who, with Dave Fultz, was Injured in their collision in the first game at American League Park yesterday, was up and about to-day and feeling pretty good in spite of his injuries. Fultz is still in the Washington Heights Hospital. and it will be several days before he cab leave there. In addition to the cut over his eye, Elberfeld's nose is broken. He went up to hospital to-day to have the injured eye dressed up, and at the same time had his nose strapped up. He complained that his chest was sore to the touch. The Kid expects to go to his home in Tennessee to-day. When the swelling in Fultz's jaw, where it came in contact with Elberfeld's head, had been reduced, it was learned definitely that there was a fracture of the jaw just below the left corner of the mouth. Although the center fielder will be able to get out this week, it will be five or six weeks before his jaw will be back in its normal condition. Incidentally, several of his teeth were knocked out. He will have to subsist on liquid food for some time. He was not hurt internally.